Located in Bonifacio, Lodge De Charme A Cheda is in a rural location, within a 15-minute drive of Pic de la Trinite and Bonifacio Port. This 4-star hotel is 4.9 mi (7.9 km) from Sperone Golf Club. Make yourself at home in one of the 41 air-conditioned rooms featuring flat-screen televisions. Complimentary wireless Internet access keeps you connected, and satellite programming is available for your entertainment. Private bathrooms have complimentary toiletries and hair dryers. Conveniences include safes and blackout drapes/curtains, as well as phones with free international calls. Cooked-to-order breakfasts are available daily from 8:30 AM to 10 AM for a fee. Grab a bite to eat at the hotel's poolside bar, which features a pool view. You can also stay in and take advantage of the room service (during limited hours). Quench your thirst with your favorite drink at the poolside bar. Buffet breakfasts are available daily from 8 AM to 10:30 AM for a fee. Make yourself at home in one of the 18 air-conditioned rooms featuring minibars. Complimentary wireless Internet access keeps you connected, and satellite programming is available for your entertainment. Bathrooms have hair dryers and slippers. Conveniences include phones and safes, and housekeeping is provided daily. Located in Bonifacio, Hôtel Version Maquis Santa Manza is within a 15-minute drive of Bonifacio Citadel and Balistra Beach. 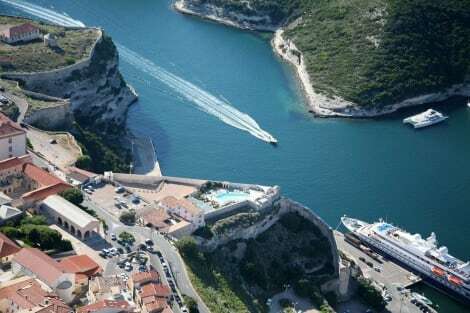 This 4-star hotel is 4.8 mi (7.8 km) from Canetto Beach and 5.1 mi (8.2 km) from Bonifacio Port. Make yourself at home in one of the 9 individually decorated guestrooms, featuring kitchens with refrigerators and microwaves. Flat-screen televisions with satellite programming provide entertainment, while complimentary wireless Internet access keeps you connected. Conveniences include separate sitting areas and irons/ironing boards. lastminute.com has a fantastic range of hotels in Bonifacio, with everything from cheap hotels to luxurious five star accommodation available. We like to live up to our last minute name so remember you can book any one of our excellent Bonifacio hotels up until midnight and stay the same night.